An emerald green highway carves through tiers of red sandstone in the depths of the Grand Canyon. Each raft that arrives at this iconic spot can breathe a sigh of relief after surviving the treacherous rapids within the Inner Gorge, and the tranquil stretch that flows between mile 136 and mile 137 is awe-inspiring. On river right, a massive waterfall cascades into the mighty Colorado River. This is Deer Creek Falls, an oasis that captures the attention of every river runner. My favorite spot on the river is Deer Creek, without a doubt. In the words of John Wesley Powell, Deer Creek “leaps into the Colorado by a direct fall of more than 100 feet, forming a beautiful cascade. On the rocks in the cave-like chamber are ferns, with delicate fronds and enameled stalks.” Deer Creek flows into the Colorado River from the northern side of the rim above. This area has limited access, so only a handful of backpackers or rafters have seen its beauty. From the river, a vertical hike to the top of a cliff provides a remarkable viewpoint. Following the narrow, gravel trail that continues up the side canyon yields a mighty reward. The trail ends at a beautiful oasis that many river runners flock to called the “Patio”. The canyon opens up to display a fantasy of green trees and a sparkling creek that flows over a myriad of sunbaked sandstone. Here, people bask in the sun, soak their feet in the cool creek, and relax their minds from their daily stressors. 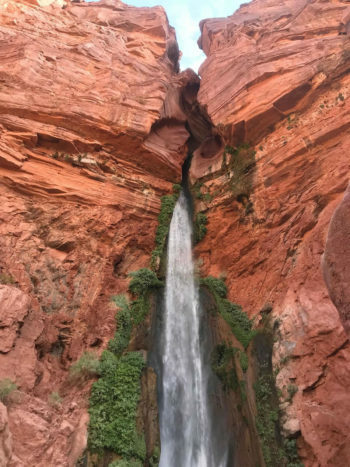 Below the most photogenic spots on the Patio, there is a small waterfall that collects in a crystal clear pool before it falls into the depth of the slot canyon. Behind this wall of water there is standing room only, and this is where I hid for a moment. My mind was flooded with thoughts of insecurity. 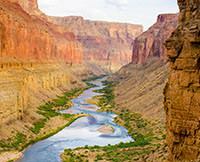 This was my first Grand Canyon trip as a guide for Western River, and I wanted nothing more than to perform my best. I didn’t want to show any sign of weakness, but I was weighed down with family troubles. 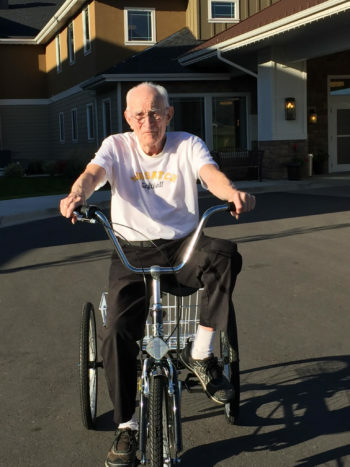 I had anxiety centered on my family who was bracing themselves for my grandpa’s passing. I learned only a few days before leaving for this trip that my grandpa (we always called him Pa) was not faring well. His health has been tumultuous for the past year, and my family knew the end was near. Unfortunately, I had to sacrifice seeing my grandpa for the last time for my first Grand Canyon trip. 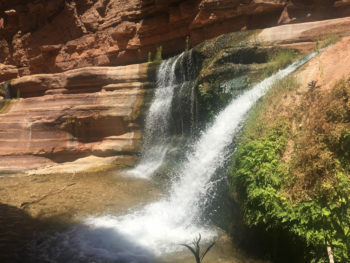 On June 28, 2017, while I lingered behind the Patio waterfall at the bottom of the Grand Canyon, I received an overwhelming feeling that he was gone. I just knew it. I felt at peace. My heart was at ease. 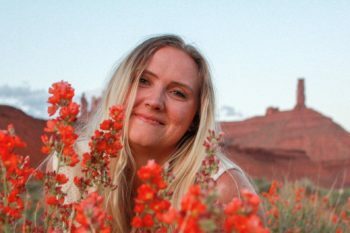 I knew my grandpa was proud of me for choosing a life and career in nature, and I knew that I was exactly where I needed to be. Coincidentally, when I got off the river and called home, I heard that my grandpa did indeed pass away. He died on June 27, 2018, the exact same day that I was sitting under the waterfall of the Patio, at Deer Creek Falls, at the bottom of the Grand Canyon. Hey! My name is Alora Bonner & I am a river guide. I started working for Western 4 years ago. My career in Athletic Training has taken a backseat to my seasonal lifestyle. I spend half of my season in Moab & half of my season in the Grand Canyon. The river has become my home & the people at Western River have become my family. During the off-season I enjoy travelling. Recently, I visited all 4 corners of the world: Peru, Europe, and Tahiti!